Occupational therapist and licensed for accessibility to services. 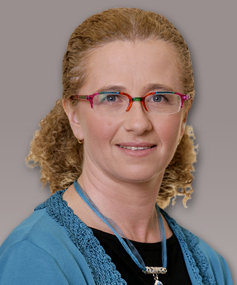 Head of the Israeli Institute of Cognitive Accessibility of Ami Association and Ono Academic College. Has extensive experience as a consultant in the field of cognitive disability to the Commission for Equal Rights of People with Disabilities in the Ministry of Justice, and as a partner in the forum for teaching persons with disabilities. Active in promoting the rights of people with disabilities in Israel. Has developed and published a unique model of accessibility for people with cognitive disabilities and has published various articles in the field of cognitive disability and cognitive accessibility in main professional journals. 2000: Ph.D. in Special Education, University of Connecticut. 1993: M. Med. Sci.​, Occupational Therapy, Hadassah Medical School, Hebrew University in Jerusalem. 1986: B.O.T., Occupational Therapy, Hadassah Medical School, Hebrew University in Jerusalem. Fundamentals of Occupational Therapy, Introduction to Health Professions, Study with the Patient – Individuals and Family, Community Involvement and Advocacy. Cognitive accessibility; Accessibility and practical intelligence in adults with intellectual disabilities. 1. Yalon-Chamovitz, S., and Avidan-Ziv, O. (2016). Simultaneous Simplification: Stretching the Boundaries of UDL. In: Networking, Implementing, Research, and scaling Universal Design for Learning, Towson MD: UDL-IRN, Pp.66-68. 2. Yalon-Chamovitz, S., Shack, R., Avidan-Ziv, O., and Tene-Rinde, M. (2016). The Call for Cognitive Ramps. Work, 53, 455-456. 3. Gutman, K., Kreim, Y. and Yalon-Chamovitz, S. (2012). Deconstructing Hierarchies: A pedagogical Model with Service Users Co-Teachers. Social Work Education: The International journal, 31, 202-214. 4. Yalon-Chamovitz, S. (2009). Invisible access needs of people with intellectual disabilities: A conceptual model of practice.Intellectual and Developmental Disability, 47, 395-400.